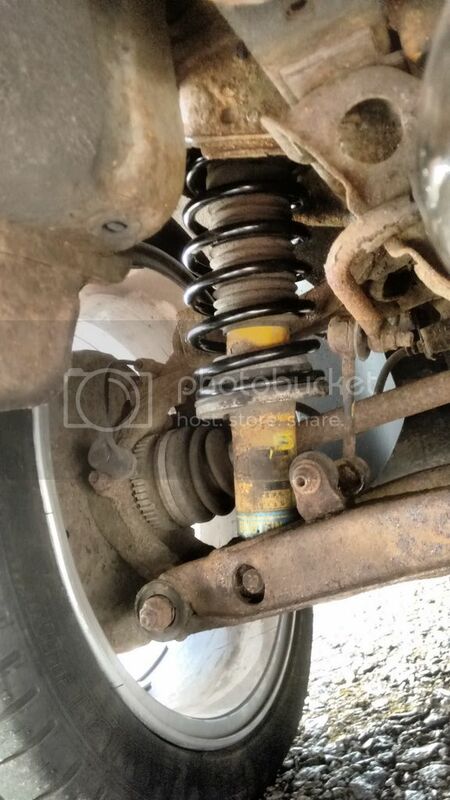 car failed mot due to rear coils so left it up to them to order new set and fit came back looking like this, first impretions were oh my god what have they done, 40mm higher at back than front i told them before hand it had bilstiens ,ok they said but what i think they have done is ti fit standard springs ? 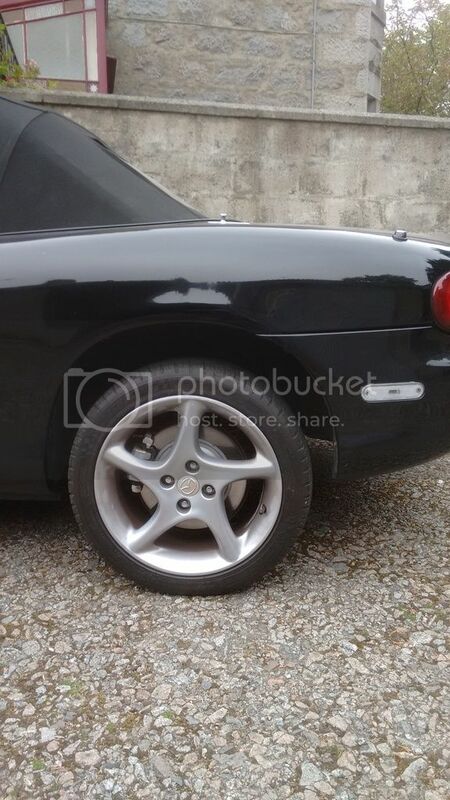 have ordered the right springs from mx5 parts and they will change them when thy come in ps have a good laugh, what do u think? They just swapped the springs? Yup, looks like they've put standard ones on. If the mk3 sport springs (the ones fitted to billies) you are welcome to them, currently have two sets taking up space in my garage. There is a reason for this and I do not think it is the wrong springs but I cannot remeber what the fix is at the moment. Contrary to common opinion, not all our Sports got Bilstein to begin with. I've a feeling what we are seeing is settling of the fronts, and no time given to settling of the new back springs. The contrast of age & wear might be the thing. 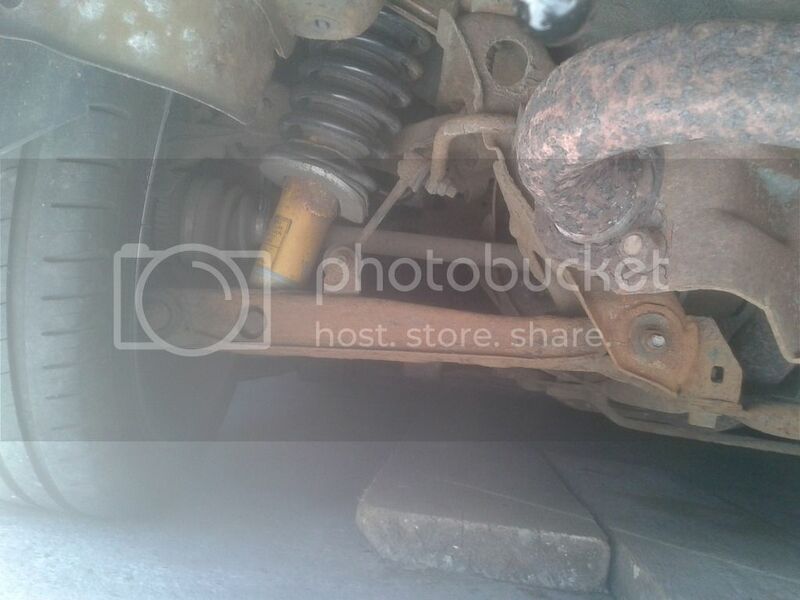 The vital point is that spring/shocks are, from new, tuned to each other for compatabilty. In that case, I hope you get the correct ones but bear in mind time & miles will have marginally softened the shocks out. This is a recent snap of our Sport still on it's original (non Bilstein) springs & shock absorbers which after 14 years in itself is a bit remarkable. Even allowing for "settling" over the years, you can see the difference although the car still rides tight & true..perhaps partly due to it's relatively low mileage. It's not gone down in ride height since we bought it nearly 10 years back. Now, our spring/shock set up from showroom is not Bilstein.Our shocks are black, and Billies are yellow. The question is, did your car actually have the original yellow Bilsteins? If black, they are often mistakenly taken for Bilsteins. Standard blacks are fine in my opinion...the only thing I'd like to do is fit uprated ARB's one day. I've seen a variety of "standard" Sport ride stances over the years! I'll be waiting with interest to see what a complete set of coils looks like. Might be a good idea to consider a full alignment lasering afterwards. Ride height, I do not know. Spring rate? I believe they were marginally stiffer...to match the harder Billies. drumtochty wrote: There is a reason for this and I do not think it is the wrong springs but I cannot remeber what the fix is at the moment. Are you thinking of the MK3 when the suspension on some cars was tightened up at the factory with the suspension uncompressed and easing it off reduced the ride height? I'm fairly sure the Bilstein springs are 25mm shorter than stock, but that might've just been for the NA. That rings a bell now Joey. The top springs definitely look like there's less distance between the coils. Unless it's snapped Joey..as they do? Aye, possibly. Just another thing to get the garage to fix! If it has snapped, you'll probably want to do both sides as they wear pretty similarly. Could be the spring perch on the Bilstien shockers is higher than stock as the Bilstein springs are stronger and shorter. Fitting stock spring therefore raises the whole car as they are designed for lower spring perches. The Konis shockers had 3 spring positions/grooves for spring perch.. stock, Bilstein and lowered.. but this is all Mk1 stuff. I Googled a bit but found nothing conclusive.. the USA have MSM and HD Bilsteins for NB so it gets hard to compare. First stop is get them to slacken the suspension bushes while the car is on the wheels and then retighten as they will have tighten them when jacked up.. that is worth an inch I would guess..
Second measure the centre of wheel to top of wheel arch .. should be 13.5" front 14" rear roughly off the top of my head.. go Google Miata NB stock ride height to find right numbers..